December the 6th is known as Saint Nicholas Day throughout Europe. In Hungary on the night of December 5th, children leave out their freshly shined shoes either on the windowsill or next to the front door for Szent Mikulás (most children simply call him Mikulás). He is Hungary’s Santa Claus figure (Szent Mikulás literally translates to Saint Nicholas, and in Hungary it is Jesus, not Santa, that brings presents on Christmas Eve). If they have been good boys and girls, when they get up in the morning, their shoes are filled with candies, chocolate, walnuts and fruit. If they have been naughty, however, Mikulás doesn’t leave them anything and their shoes are, instead, filled with onions, coal and willow switches by Mikulás’s frightening elf companion, Krampusz. Mikulás visited our house for the first time when our oldest son was two. The entire family put out our shoes next to the front door and went to bed. When we got up on Szent Mikulás Day (December 6th) our little guy was ecstatic to find his favorite European treats tucked into his shoes (Kinder chocolate, Boci chocolate, etc.). That night, as we were getting ready to go to bed, he started collecting all of our shoes and setting them up next to the door. Try explaining to a two year old that candy isn’t going to magically appear in his shoes every morning. 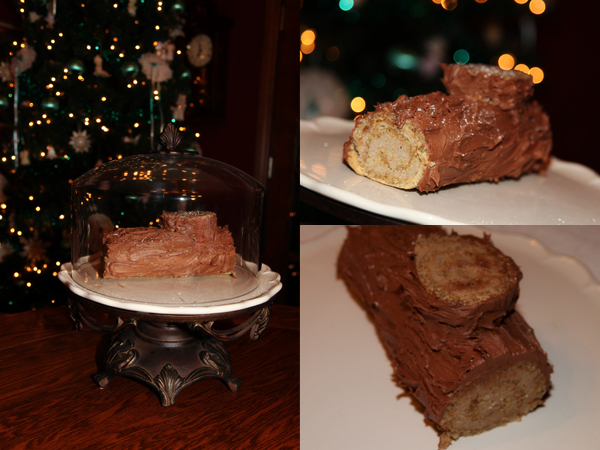 I have wanted to make a Bûche de Noël (which is just a fancy-schmancy way of saying yule log) for years and I decided that now is as good a time as any. 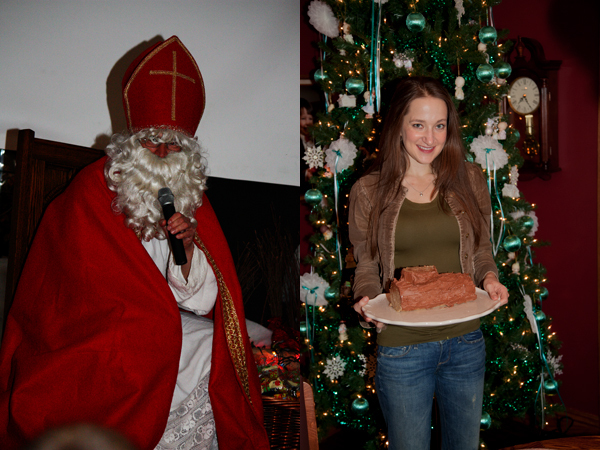 In honor of tomorrow being Saint Nicholas Day, I decided to give it a whirl. 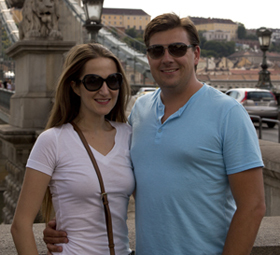 I scoured the internet and found a recipe that had a bit of a Hungarian flair. I also did some research on how to roast chestnuts. Special thanks to Smitten Kitchen for her method. David is absolutely in love with everything about this cake. Butter a 15”x10” jelly roll pan and line it with parchment. In a small bowl, whip the egg yolks by hand until lightened. In the bowl of an electric mixer fitted with the whisk attachment, beat egg whites until foamy. Slowly add the powdered sugar one Tablespoon at a time. Beat, on high, until stiff peaks form. Turn the mixer to low and slowly add the egg yolks. Once fully incorporated mix in the ground walnuts and baking powder. Mix until just combined. Spread evenly in parchment lined jelly roll pan. Immediately turn cake out onto a linen dish towel. Remove parchment and turn cake so that the bottom is touching the towel. Roll the cake up in the towel from small end to small end. Set aside on the counter for at least 20 minutes. Heat oven to 450 degrees Fahrenheit. Cut an “x” into the top of each chestnut with a very sharp knife (David would actually kill me if he knew I did this because I’ve cut the tip of my finger off… twice). It is okay if you cut into the chestnut a little way. Roast the chestnuts for about 20 minutes until the “X” starts to peel back and the shell has turned an even darker shade of brown. Allow to cool completely and then peel the chestnuts making sure to remove the entire husk (don’t worry if removing the husk causes the meat to fall apart, you will be pureeing them anyway). Place all of the peeled chestnuts into the bowl of a large food processor. Pulse until they resemble small pebbles. Add butter and continue pulsing until it resembles coarse sand. Add sugar, rum, whipping cream and vanilla. Processes until you reach desired consistency. Unroll cake and spread with chestnut cream. Roll the cake back up and wrap it in the towel. Refrigerate for 30 minutes or more. In the meantime, make the chocolate buttercream frosting. Melt the semi-sweet chocolate chips in a double boiler over medium heat. Let cool. Cream the butter with the sugar and the cocoa powder. Add the semi-sweet chocolate to the rest of the frosting. Unwrap from the towel and place on a serving dish. Frost the cake in small, uneven strokes so that the frosting looks like bark. Cut off one end of the cake and place it on top of the larger cake so that it looks like a knot on the log. Sprinkle with powdered sugar (so that it looks like freshly fallen snow). 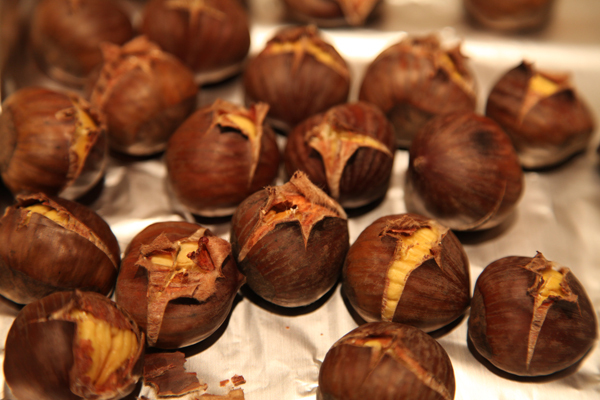 This is what the chestnuts look like at the end of roasting. But is powdered sugar, icing sugar? Yes, powdered sugar is icing sugar.